A promise bound to be broken! A LOWER price for power in Tasmania is due to be set within weeks. Deputy Premier and Energy Minister Bryan Green today said the Economic Regulator's report had confirmed the state's electricity prices would fall from January next year. The new prices would be set by the Economic Regulator after the State Government recommended tariffs for approval over the next fortnight, he said in a statement. "While we can't say definitively what the decrease will be until then, we are confident that it will be greater than our original prediction last month (of between 1 and 2 per cent)," Mr Green said. "Electricity prices around Australia are continuing to go up but we are bucking the trend in Tasmania. "Recent electricity prices rises experienced in Tasmania will soon be a thing of the past." Mr Green said the State Government was on target to introduce retail competition in Tasmania's electricity market from January 1, which would put more downward pressure on prices. Also note some of the comments on the original article, that gives you a better idea of how the public feel about it. It's just getting better ??? HOBART'S average unleaded petrol price has climbed by about 4c in the past 10 days, while the wholesale price paid by importers has fallen by 7c . THE Singapore wholesale price had been sinking steadily, from a July 15 peak of $141c to below $129c, according to Australian Institute of Petroleum figures. ULP prices which yesterday varied between 162.7c and 166c in Hobart were too high for many Tasmanians to afford. The ULP price has climbed about 10c in the past two weeks and more than 20c in the past year. Prices in other parts of Tasmania have been even higher. Mr Taskunas said the rapid rises had been particularly harsh on premium fuel users, but not so painful for diesel buyers. Premium 95 petrol yesterday averaged 173.7c a litre, down from a 174.3c peak on Wednesday, while Premium 98 has sat just under 180c since Wednesday. Average diesel prices have risen more slowly, about 1.5c in the past week, and remain below unleaded petrol at 161.6c. Mr Taskunas said the continuation of such high prices was costing many Tasmanians as much $10 a week in unavoidable fuel bills. "That's $40 extra a month, and nothing else has gone down. With higher power bills and winter heating, it's hurting people," he said. 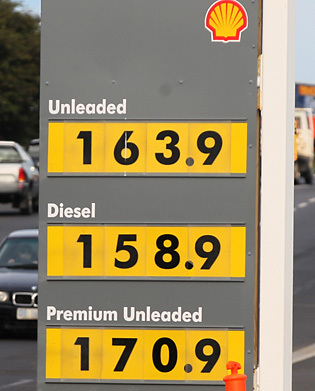 Mr Taskunas said fuel price rises typically occurred sooner and a lot more rapidly compared with price reductions and a repeat of such a scenario would be grossly unfair on Tasmanians, particularly pensioners and low-income families. He said the perennial price gap between Tasmania and other interstate capitals had narrowed during the surge in global wholesale prices. "That's often the case when the price goes up, it does narrow" he said. Commsec experts believe prices will continue rising nationally by as much as 3c in the next two weeks and said the pain had been amplified by the rate of the climb the fastest increase since 2009 of about 16c in two months. Australian Industry Group chief economist Julie Toth said fuel price rises directly impacted on business transport costs and made consumers more wary of spending on luxury items. Prime Minister Kevin Rudd this week scrapped the $330,000-a-year Petrol Commissioner position, which he had implemented in 2008. The price squeeze is expected to increase the use of shopper dockets. MOTORISTS are being hit by spiralling petrol prices as Hobart's average price hits 160c a litre. Prices have jumped about 6c a litre since last Friday because of increases in world oil prices. Users of 95 or 98 premium blends are being hit hardest, with the fuel selling from 170c to 180c a litre. But diesel prices have remained steady, with prices cheaper than petrol for the first time in many years. The RACT's Vince Taskunas said the surge in local petrol prices was predictable because of rises in Singapore's unleaded petrol wholesale price. Mr Taskunas said the Singapore price had fallen below Friday's level and he hoped that would cause prices to remain about 160c a litre. "We're hoping that that's the extent of it," he said. Mr Taskunas said recent rises in global oil prices had been amplified by the sharp drop in the Australian dollar. He said the increases were hurting motorists, especially those whose cars needed high-octane petrol. Mr Taskunas said motorists whose cars ran on diesel were being spared price rises. "Diesel users are not being punished like they usually are," he said. Mr Taskunas said there had also been a narrowing of the price gaps between Hobart and interstate capitals including Melbourne and Adelaide. He said that some service station operators had noticed that motorists whose cars required high octane fuels were switching to standard unleaded fuel but returning to their outlets with engine problems. At the start of this month, the price of oil was $US100 a barrel for the first time in a year, with concerns Egypt's political problems could lead to wider unrest in the Middle East's oil-producing countries. And analysts are predicting the Australian dollar could fall further. There are fears that higher petrol costs could trigger a further reining in of discretionary spending in areas such as shops and restaurants by people who are struggling to reduce their petrol consumption. The national average price of unleaded fuel increased by 13c a litre in a fortnight. Interstate motorists have also been warned to expect unleaded petrol prices to hit 160c a litre by the end of the month. Well as expected it's not taken long for the price to go up. For the last few months the average price for ULP (91 octane) has been $1.53 – $1.55 a litre. So it's anyone's guess as to just how much further the prices will go.